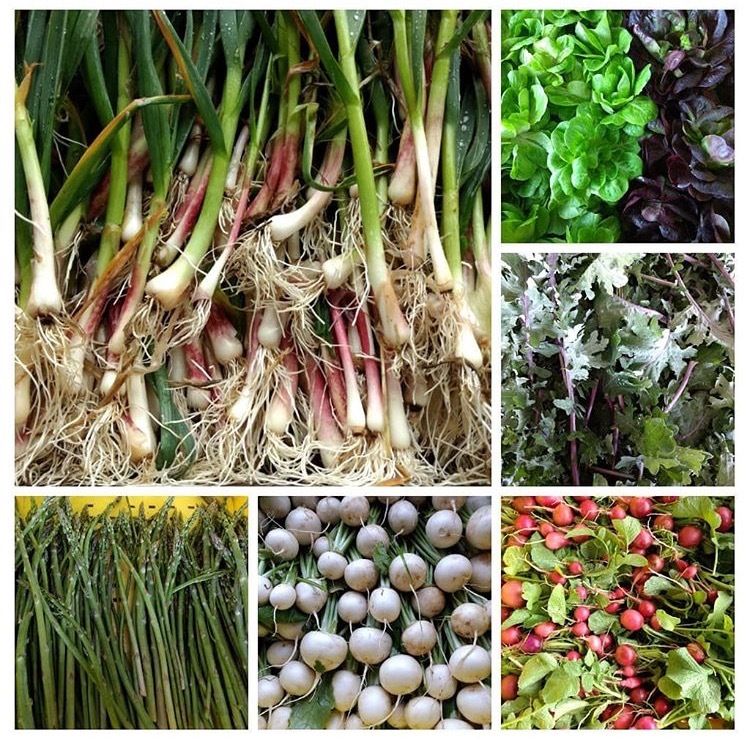 This Week's Share: Greens, Onions, Garlic Scapes and More! Doesn't this make your mouth water? Instagrammer ianblackwellrogers posted this photo of a truly delicious-looking nicoise salad he made using garlic scallions and lettuce from the farm. Thanks for the salad inspiration! Want to see your photos featured in this weekly email? Just snap a pic -- from the farm, from your CSA share itself, or even a recipe you make with your Clagett produce -- and either email it to us or post it to Instagram with the hashtag #ClagettFarm! It's almost June! Hope your summer is off to a good start! SNEAK PEEK FOR NEXT WEEK: We should be getting zucchini (!) starting next week. Lots of herbs: garlic chives, thyme, oregano, sage, sorrel, onion chives (edible flowers), cilantro, dill, basil. This week's photo montage of pretty produce comes from Clagett volunteer dweiums on Instagram. Love seeing this spring bounty from the farm! Want to see your photos featured in this weekly email? Just snap a pic -- from the farm, from your CSA share itself, or even a recipe you make with your Clagett produce -- and either email it to us or post it to Instagram with the hashtag #ClagettFarm! Hope you're having a great week and enjoying a little sunshine (finally!). The rain has slowed down the growth of your produce a little, but we'll bounce back quickly. Now, on to the vegetables you'll be getting this week. Lots of herbs: garlic chives, thyme, oregano, sage, sorrel, onion chives, cilantro, dill. This week's photo comes from The Chesapeake Bay Foundation on Instagram. Want to see your photos featured in this weekly email? Just snap a pic -- from the farm, from your CSA share itself, or even a recipe you make with your Clagett produce -- and either email it to us or post it to Instagram with the hashtag #ClagettFarm! We've just transplanted our tomatoes, eggplants and peppers into the fields this week. The onions, squash and cucumbers are doing well -- they're about a month away. We trellised the sugar snap peas this week and they are looking great. We are keeping the deer out but there are some ambitious groundhogs that have evaded our traps. Kale is coming very soon. We should have cabbages and kohlrabi in 2 to 3 weeks. We're a little anxious about our first planting of corn and the u-pick tomatoes, chiles, tomatillos and ground cherries. They have had to wait in the greenhouse until the soil dries a little, and they are a little desperate to be planted. And we planted the last of the potatoes last week. We planted 1,000 pounds of seeds, which should make lots of potatoes by August or September, if all goes well. Fingers crossed for good growing conditions ahead! Lots of herbs: garlic chives, thyme, oregano, sage, sorrel, onion chives (edible flowers), stinging nettle (be sure to wear gloves, sleeves, pants and closed-toed shoes! ), cilantro, dilll. It's Week 1 of the CSA Share Season! Here's a Preview of What You'll Be Getting. 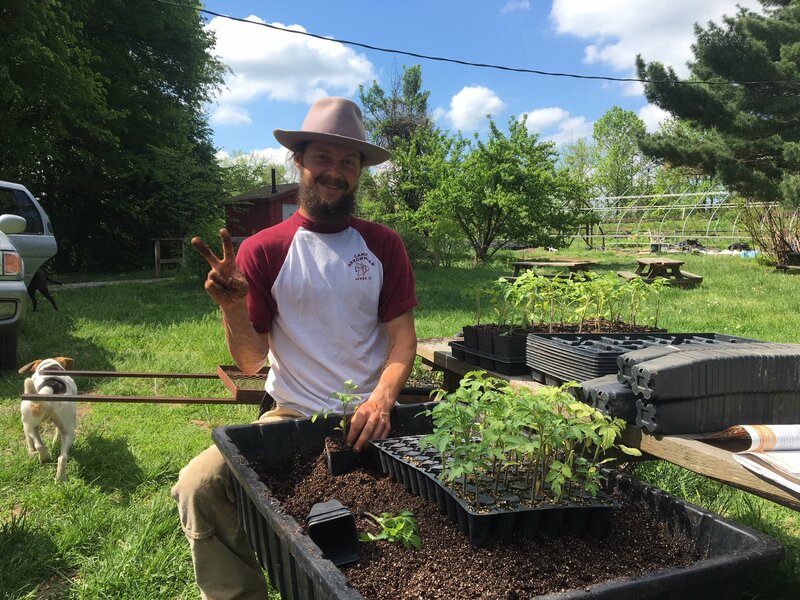 Here's one of our new farm staff members, Garrett, potting up tomato plants for this week's share. Would you like to see your photos featured in this weekly email? Just snap a pic -- from the farm, from your CSA share itself, or even a recipe you make with your Clagett produce -- and either email it to us or post it to Instagram with the hashtag #ClagettFarm! It's time for the first shares of the season, which will take place this Wednesday, May 9th & Saturday, May 12th. We have a new manager for the Dupont pick-up: Garrett. We are looking for someone to help Garrett every Wednesday from 5:00-8:00 pm. The volunteer will receive one free CSA share in exchange for helping Garrett unload the van, set up the share, keep bins filled, interact with our members and pack up when it’s over. In case you're not familiar, the address for the Dupont pick-up is 1737 Fraser Ct, NW, and the CSA season runs May 9 through November 7. Ever Wednesday afternoon we send an email that tells you the contents of the share, along with the amounts of each vegetable. We send this as soon as the harvest and calculation are done -- they're not exact but they're very close. Wednesday's email also serves as the preview for Saturday. a choice of salad mix, including lettuce, spinach, spicy mix and tat soi. We'll go heavier on lettuce and spinach because they are available fewer weeks: They don’t like the heat. On U-Pick this week: In addition to the vegetables we harvest and deliver for the CSA shares, each week we'll let you know the items that are available for you to pick in unlimited quantities out at the farm. This week that includes garlic chives, thyme, oregano, sage, sorrel, onion chives (edible flowers), stinging nettle (Be sure to wear gloves, sleeves, pants and closed-toed shoes!). Coming soon: radishes, turnips, kale, collards, and basil. We expect cilantro to be added to U-Pick next week. We have the pick-up locations and times published on the blog. And there's a handy FAQ there, too. STILL WANT TO JOIN THE CSA? Haven't purchased or know someone who wants to be a member this season? We still have several slots left. Sign up now!